As Arctic sea ice diminishes, polar bears are expending more energy to find food, and a new study details their efforts to stay alive. Being a polar bear can be hungry work. 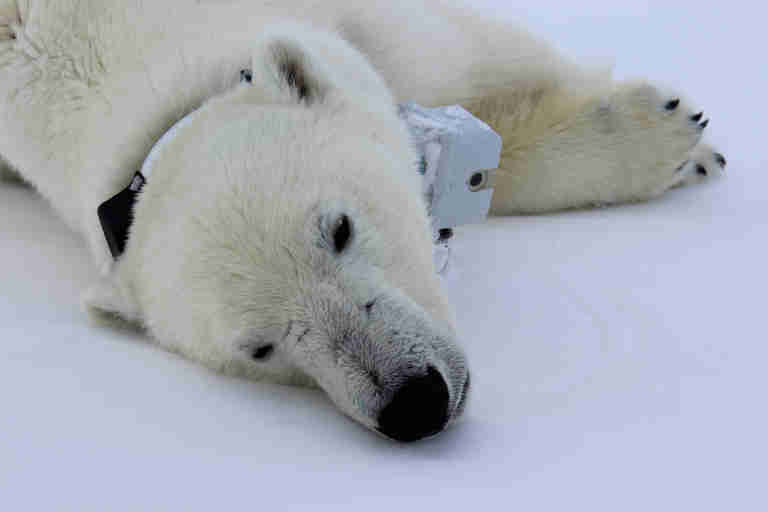 A three-year experiment used camera and GPS-equipped collars to track polar bears as they stalked their prey on the ice of Alaska’s Beaufort Sea, giving scientists new insights into the struggles facing those iconic animals. It turns out the bears burn about 12,000 calories a day — about 60 percent more calories than previously thought — and many of them don’t seem to be getting enough to keep up. The collars captured the bears ranging across the Arctic shores and diving into holes in the sea ice in pursuit of their typical food, seals. The local varieties, ringed and bearded, make for high-fat, high-protein meals polar bears need in the summer, when receding sea ice makes it harder to hunt. Anthony Pagano, a wildlife biologist with the US Geological Survey in Anchorage, told Seeker the newly published research offers a glimpse of life on the ice that humans typically can’t get. “These animals are in extremely remote environments, where it’s typically impossible to observe individuals for a prolonged period of time,” said Pagano, the study’s lead author. The findings were published February 1 in the research journal Science. Pagano and his colleagues studied a total of nine female polar bears living along the Beaufort Sea from 2014 to 2016. Every year, they would tranquilize two to four bears, take blood samples and outfit them with collars. Then they tracked the animals for up to a week and a half each April, following their movements, watching them hunt and eat. At the end, they retrieved the collars, weighed the animals and tested their blood chemistry to gauge their metabolic rates. Five of the nine lost weight during the survey period, while the rest put on pounds — some of them fluctuating by about 10 percent of their original body weights over the course of a week to 10 days. “It highlights their need to put on a lot of body fat to sustain them through periods when they might not be able to successfully catch seals,” Pagano said. The results may seem like “pretty simple information,” but the dietary needs of polar bears have only been estimated before, he said. Polar bears are listed as threatened under the US Endangered Species Act and as vulnerable by the International Union for the Conservation of Nature — a designation just short of endangered on both lists. Despite what you may have heard, the sea ice that makes up their hunting grounds has been diminishing by about 14 percent a decade, and the ice that does form freezes later and melts earlier. Not only does shrinking sea ice make it harder for polar bears to hunt, but being ashore for longer periods means they’re at greater risk of being killed by humans. Meanwhile, as an apex predator, their bodies also build up high levels of toxic pollutants like mercury, pesticides, and chemicals used in flame retardants and non-stick coatings. The Beaufort Sea population that Pagano studied has declined by about 40 percent since 2005. Previous studies found other animals are going without food longer than they did in the 1980s and 1990s, the study notes. Globally, the polar bear population is thought to be holding roughly steady at around 25,000-30,000, Andrew Derocher, who has studied the species Canada’s University of Alberta since the 1980s, told Seeker. But some populations have seen sharp declines, while other researchers have found bears in some communities are smaller and less heavy than they used to be, he said.